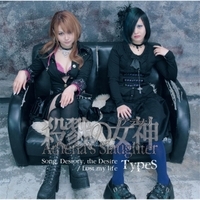 Athena's Slaughter is Twin Female Fronted Metal Band from Japan. Formed in 2014 with ReN (Guitar) from "No Limited Spiral" and "AufHeben" , Crazy (Drums) is ex. "NEO JOKER" and KAWAYAN (Bass) is ex. "MEIN KAMPF". LunA (Vocal) and MAYLA (Vocal) In addition, full-scale start-up than in 2015! Release the first single on May 8, 2015 and debut and release tour in Japan.